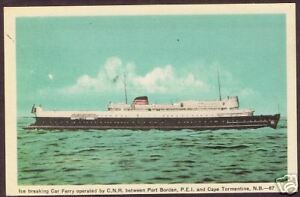 Vintage Postcard Ice Breaking Car Ferry Operated By C.N.R., N.B. 1941 HOFFMANN PHOTO CARD SHOWING REVIEW OF SMS "SCHLESWIG-HOLSTEIN"
 OLD SHIP POSTCARD CASSIERS SIGNED RED STAR LINE T.S.S. "LAPLAND"
CONITION IS. UN-USED. ,, DISPLAYED ,,, HANDLEING WEAR ,,, BENT CORNERS ,,, SCRATCHES FROM BEING SHUFFLED AROUND FROM BOX TO BOX ,,,, GREAT ADDITION TO ANY COLLECTION.